The most common description of polls is that they are snapshots, not predictions. A good way to look at that in the 2008 election is to compare the '08 campaign with the two that came before. 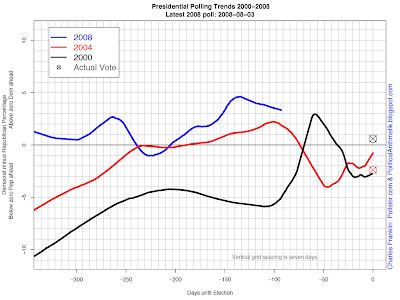 The chart above shows the trend estimates for each of the last three presidential campaigns. I'm plotting the estimated margin between the two candidates, Dem minus Rep, for each year. With 93 days to go until the 2008 election, Obama holds a 3.3 point advantage over McCain, though that has been eroding over the past six weeks. If we put a confidence interval around today's estimate, we get a race that is just barely leaning Democratic. But what about the future? The dynamics of the next 92 days are all important for where we stand on November 4. Since we can't foresee those 92 days yet, let's see what happened during the same time in 2000 and 2004. That gives us a better idea how much change we might anticipate in the next three months. In 2004, Kerry slowly built a 2 point lead by this time, and held a small lead through much of the summer. But then the race took a sharp turn, with Bush making a 6 point run, taking a four point lead with 50 days to go. Kerry gained back 3 points of that in the polling, but less than 2 points of it in the actual vote, losing by a 2.4 point margin. In 2000, Bush led in most of the early polls, holding a 6 point lead with 107 days to go. Then Gore moved sharply up, erasing Bush's lead and then adding a 3 point lead for Gore with about 56 days left. Bush promptly reversed Gore's gains with a six point move in the GOP's direction, and led by about 3 points over the last three weeks of the campaign. Of course, the 2000 polls were misleading in predicting a Bush win. Gore won the popular vote by 0.6 points. So far in 2008, Obama has enjoyed a run up of 5.5 points since his low point in late March. That run is on a par with Bush's in 2004 but still a bit less than Gore's 9 point run in 2000, and on par the Bush's 6 point rebound that year. Judging from the dynamics we've seen in the past it is quite reasonable to expect the current trend to shift by half-a-dozen points. August and the conventions have been periods of substantial change in both previous elections, so if history repeats itself the next 4 or 5 weeks should be pretty interesting. The bottom line is neither campaign should be complacent or despondent. There is a lot of time left and recent history shows that both up and down swings of 6-9 points are entirely plausible. As a P.S. 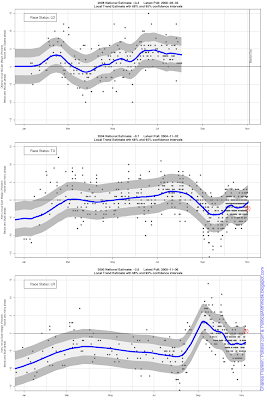 here are the three campaigns with educational confidence intervals around them. The current 2008 estimate is just barely inside the "lean Dem" range, and will move to toss up if the current trend continues for another couple or three polls. The 2004 estimate was pretty close to the outcome which was well within the 68% confidence interval around the trend. The polls in 2000 were troubling for having the wrong popular vote winner, but even there the outcome was inside the 95% confidence interval. With races as close as the last two, it is worth appreciating just how wide those confidence intervals are. Our efforts to characterize races rely on the best estimates of those confidence intervals, but it is all too easy to focus on who's ahead and not remember how much uncertainty there is. That uncertainty is both about where the current estimate says the race stands today and about how the race may change in coming weeks. The data here show that unless one candidate builds a bigger lead than either has held so far, the uncertainty remains pretty big. Note: My trend here is slightly different from the Pollster National trend because I'm working off the difference between candidates, not each trend separately, and because I've made 2008 comparable to 2000 and 2004, just a slightly different amount of smoothing compared to Pollster's standard estimator this year. None of those differences change the qualitative picture or shift the magnitude of changes I cite above.